Welcome to the Singapura Breed Council Website. This site is a way that Singapura Breed Council members can stay in touch and for new people to learn more about our wonderful breed. 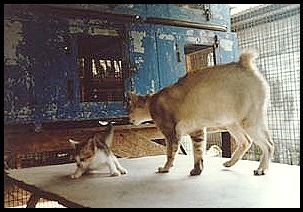 The first Singapura cats to appear were imported into America from Singapore by Hal and Tommy Meadow in the mid-seventies, having been found and adopted in the Loyang area by a geophysical work boat crew. The breed was carefully developed from Ticle, Pusse, Tes, George and Gladys, the latter two being offspring from Ticle and Pusse. 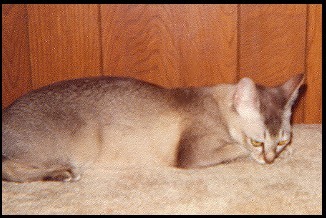 In 1980 a further cat, Chiko, was imported into America. 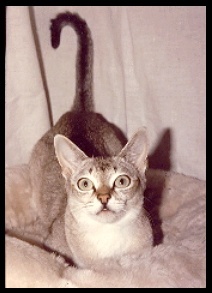 Hal and Tommy Meadow worked diligently breeding, perfecting, and promoting "their" cat, the Singapura. A giant step was taken when other breeders other than the Meadows became involved in the Singapura breed. In 1981 the Singapura became accepted for registration status. The Singapura has gone from a small group of dedicated breeders to the Singapura of today with a vast and diverse group of independent, experienced and committed breeders. The look of the Singapura remains unaltered today from the early imports from Singapore. 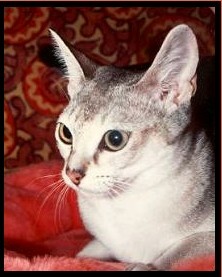 The Singapura is an alert, healthy, medium sized cat of foreign type. The body has good bone structure and is moderately stocky and muscular, yet gives an impression of great elegance. Females tend to be slightly smaller than males. The breed has noticeably large eyes and ears. Remnants of the tabby "M" are visible on the forehead along with "cheetah" lines extending down from the inner corner of the eyes. The Singapura is also noted for its ticked (agouti) coat. Singapuras all have the same coloration with only one colour allowed. Body colour is an old, golden ivory with a soft warm effect, ticked with sepia brown. Ticking refers to the presence of bands of different colour on the hair shaft. Each hair on the Singapura has at least two bands of sepia brown ticking separated by light bands, light next to skin and dark tip. Muzzle, chest, stomach and inner legs are an unticked light ivory colour similar to unbleached muslin. Some barring is shown on their inner front legs and back knees. The Singapura coat is also short, silky, close lying and requires minimal grooming. Eyes are large, set not less than an eye width apart, held wide open, but showing slant when closed or partially closed. Eye colour can be found in hazel, green or yellow. The Singapura has an enchanting personality. To be owned by a Singapura is like having another member of the family, a caring affectionate and sensitive friend. They have soft, gentle voices and love and genuinely seem to need their humans. Being vigorous cats, they are active and lively, with a love of warmth. The desire for closeness with their humans is a trait common to all Singapuras. Their stature makes them gentle cats, but they are also very interactive cats that remain playful throughout their lives. They are mischievous, intelligent and inquisitive, and will investigate anything thoroughly and want to be involved in all their human's activities. They also get along remarkably well with other pet animals. Singapura owners greatly enjoy the charm of this mischievous, good-natured, gentle and outgoing breed.